VietNamNet Bridge - The majority of Vietnamese people still support eating dog meat because this is a nutritious traditional food in the country. To be civilized, Vietnamese should stop eating dog meat! A recent survey on VietNamNet, with the participation of more than 3,000 readers, showed that only a small part of them protested eating dog meat (20 percent). The majority of people still supported eating dog meat. Up to 66 percent of the readers said that dog meat is nutritious food and it has been traditional food for a very long time. Some 13 percent said eating dog meat is okay but dog slaughtering must be strictly controlled, avoid embarrassing images. Most readers said foreign tourists to Vietnam should respect the country’s culture. They should not condemn or boycott the Vietnamese tourism because the Vietnamese eat dog meat. Each nation has its own culture and it is unable to bring cultural norms of this nation to impose on the others. Each nation always has the dishes that other people cannot eat, even disgusting. However, if someone expresses disdain, it is the cultural stigma. Many people also said that civilization or culture is in human behavior, in the way people communicate with others, not depending on the eating of dog meat or not. Each dish has its history of existence. 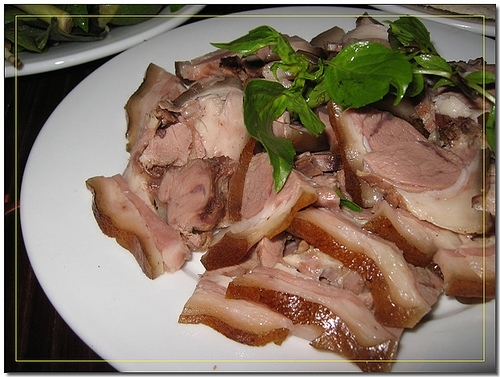 The Vietnamese has long thought that eating dog meat in the early year or early month will bring about bad lucks. But eating dog meat at the end of the year or the end of the month after having bad lucks will help chase the bad lucks. As such, they form a "culture" in eating dog meat and Vietnamese not always eat dog meat and dog meat is not daily food. However, considering that in some ways, if possible, Vietnamese should remove dog meat from their meals. Today, many families raise dogs as pets and they consider them as friends. Human affection for dogs has been improved, therefore, not eating dog meat will show the friendly attitude to animal lovers at home and abroad.